Patrice Orsini travelled to Nepal in the spring of 2018. She is an Education student on the Waterloo campus. As a student of the Bachelor of Education Program at Wilfrid Laurier University, I was fortunate to have the opportunity to complete an alternative placement in an international setting. I chose to travel to Nepal with a group from the Faculty of Education to represent the Education and Leadership Institute (ELI). As a group, we travelled to several schools in Nepal to conduct professional learning workshops with Nepali educators. Stepping off the plane in Kathmandu was a rude awakening of the senses; the honking horns, heat, and smells are truly overwhelming, and it’s not for nothing that it’s often referred to as “Dustmandu.” We found refuge from the dust and crowds in Boudhanath, a peaceful religious area that houses one of the largest Buddhist stupas in the world. We were soon busy shopping and preparing materials for our workshops. For our first workshop, we travelled about five hours to the mountain village of Kiul, where we met with a group of principals and administrators. That night we were treated to large plates of daal bhat and laid our weary heads down on some not-so-comfortable beds at a Trout Eco Resort – literally a trout farm with a guesthouse attached! Despite a slight language barrier, we were able to communicate our big ideas, and had our first taste of Nepali hospitality. The people in Nepal are the friendliest I have encountered anywhere in the world; it’s impossible to leave Nepal without having made several close friends and many, many Facebook friends! From Kiul, we travelled back to Kathmandu to recuperate before making another trip into the mountains, to the town of Banepa. There, we set up shop at Vidhya Sagar Secondary School and had a wonderful time connecting with the teachers and students. The students immediately ran up to us and grabbed our hands, dragging us from class to class for introductions. The teachers were eager to learn and share what they were doing in their own classrooms. We saw this attitude throughout the schools in Nepal. Many of the villages were hit hard by the 2015 earthquake, the effects of which are still painfully visible. Most of the classrooms are open to the elements, missing walls or parts of the ceiling. When it rains, there are pools of water on the classroom floors. Although their facilities are lacking, the students come to school everyday smartly dressed in their school uniforms. Even if their teacher is not there, the students come to class and study independently. The dedication we saw from the teachers, administrators, and students was heartwarming. Travelling up into the mountain villages was a long and bumpy process. Due to the state of the roads, it is necessary to travel by jeep. Hours of bouncing every which way over dusty roads resulted in several upset stomachs. If you get motion sick easily, Gravol is a must on these trips. The villages are picturesque and lovely, especially when compared to the bustle and noise of Kathmandu. Almost all of the traditional homes were destroyed in the earthquake; most of these have not been rebuilt, so the villagers live in small shelters beside the ruins of their old homes. Despite the hardships they have faced, the people in these places were so welcoming and generous, always inviting us for tea and trying to feed us enormous- and delicious!- meals. We experienced this type of hospitality in the village of Sermathang, which was my favourite part of our journey in Nepal. A Sherpa village located 8,700 feet above sea level on a ridge in the Himalayas, Sermathang has stunning views of the Helambu Valley and surrounding ranges. Villages dot the mountains, and it is incredible to see how many people are etching out a living in this beautiful and challenging landscape. Our lodgings in Sermathang were simple but cozy and we enjoyed hearty home-cooked meals prepared on wood burning stoves. It was truly a privilege to see and experience what life is like in a Nepali village. One reason I chose to come on this trip was that I felt it was an opportunity to experience Nepal in a way beyond what a typical tourist would see and do. I am also wary of participating in voluntourism. I felt that, on this trip, we had the opportunity to share our professional knowledge and resources with Nepali teachers, and in turn learn from them. It felt like we were leaving each school with practical ways they could improve their teaching and help change their communities for the better. Travelling back home after a trip like this is always sad; you are leaving behind new friends and a place that you may never see again. Coming back to Canada reinforced, more than ever, how privileged we are to live in this country. We truly have so much here, and we have so many opportunities that are not available to most human beings simply because of where they are born. 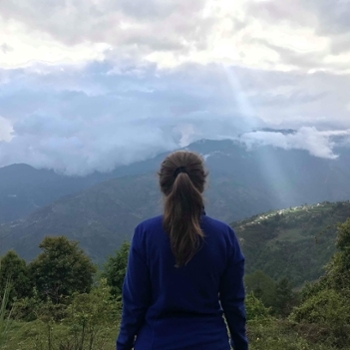 Every place I travel to changes me a bit; the experiences I had in Nepal have shown me a simpler way of a life and a dedication that I hope to bring to my career as a teacher. Read more about the trip to Nepal, led by Laurier education professors Judy Halpern and Bruce Alexander.